AverageBro: Poll Position: Slots Are Evil... But So Fun. 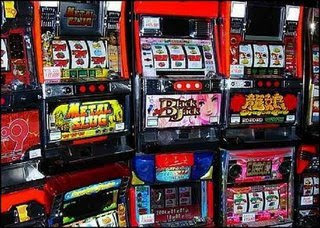 Poll Position: Slots Are Evil... But So Fun. Last week, I brought ya'll about an unprecedented display of blogger gulliness when I allowed you to vote on how I should vote on today's Maryland ballot initiative to allow slot machines in The First State. Personally, I was leaning toward voting for the measure. None of the slot parlors will be within an hour of my home. I'm not a big gambler anyway, so the possibility of having another alternative for entertainment is appealing without being harmful. I also don't buy for one moment that the state's schools will benefit in any way, so this vote would be for the sake of occasional fun only. The polls said I should reconsider my stance. Your opinion, combined with some sage over-the-pulpit advice from my pastor this weekend have lead me to change my mind on slots. As opposed to being for, I'm decidedly lukewarm now, which means I will either not vote for the measure at all, or vote against it when I hit the polls today. I guess the net-net is that for many people and their communities, slots will indeed be harmful. The risks (crime, addiction, devaluing of property) outweigh the questionable rewards (school funding, an occasional good time) that could come as a result. So, score one for AverageNation™.